Spring time and smiles is what pops into my mind when looking at this card I received as a swap. I would love to give credit to the creator but unfortunately she didn't label her creation. I love how she used the Petal Pair Embossing Folder for the strip to the right of the stamped image to give the card that added pizzazz. 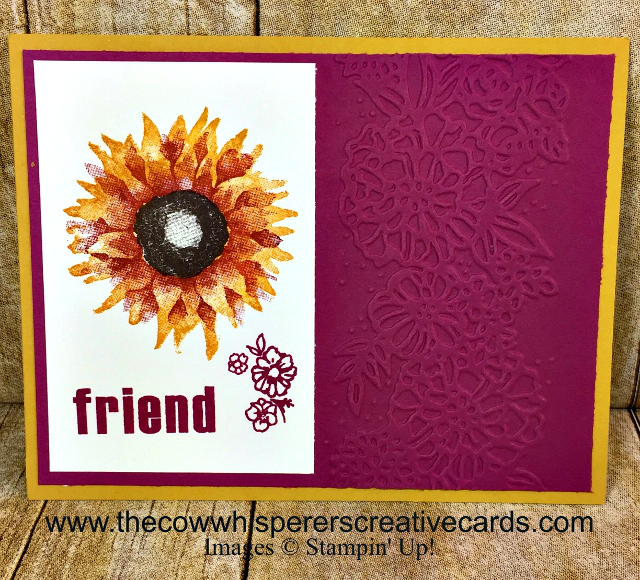 If you enjoy two step stamping then you'll love the Painted Harvest Stamp Set, and I also give a great tip for lining it up in the video below. 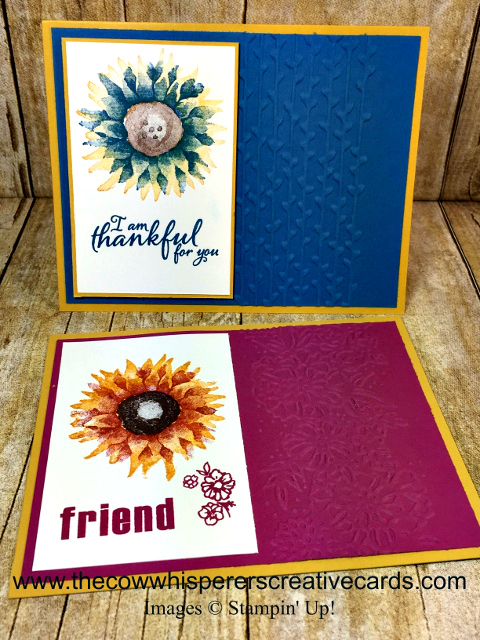 The orginal creator went with Crushed Curry and Berry Burst for her color combination and the flowers from the Petal Pair Embossing Folder Set. I wanted to bring my own twist to it, so I stuck with Crushed Curry but went with Pacific Point and the leaf stems from the Petal Pair Embossing Folders. You know I'm all about keeping it real, so I will say I wish I had moved the embossing folder a little further to the right. With that being said I still think the card turned out adorable. First Layer - Pacific Point - 5 1/4" x 4"
Second Layer, Crushed Curry - 3 3/4" x 2 1/2"
Third Layer - Whisper White - 3 5/8" x 2 3/8"
Love these cards and the set. Great idea with the EF. Such great cards - love this stamp set! !